SCE crews ready new power poles at the Sand Fire staging area. New poles wait to be loaded onto trucks at the Sand Fire staging area near Magic Mountain. Crossarms are stacked in the staging area. SCE crews prepare trucks for restoration work in areas damaged by the Sand Fire. SCE crews attend an early morning safety briefing to discuss upcoming repair work. SCE's Mobile Command Center is on site to help crews during the Sand Fire restoration efforts. SCE trucks are prepped in one of three staging areas. Power poles are prepared for transport. One of three staging areas prepped with new equipment that will be used in the Sand Fire restoration efforts. Working with first responders, crews are given ground access to start repairs to damaged equipment. UPDATED, July 28, 8:00 a.m.
As Troy Whitman leaves the Sand Fire camp with the first responders and jumps into his red truck, he sees a dark plume of smoke in the distance. He drives off hoping it’s not a new fire. Luckily, the smoke is white now and it is clear it’s from the same fire, likely a burning structure. Whitman is part of Southern California Edison’s fire management team and he’s on his way to the laydown yard staging area near Santa Clarita to meet the 28 five-man crews who have been given the OK to start restoration efforts on Wednesday. The Sand Fire began on Friday in the Los Angeles area of Santa Clarita and has so far consumed more than 38,000 acres and destroyed 18 structures. The fire is now 65 percent contained. 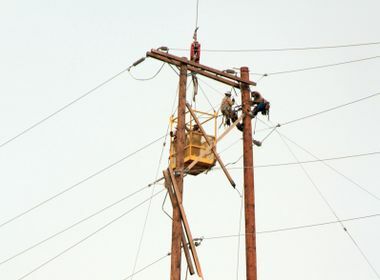 In the fire’s wake, an estimated 240 power poles have been damaged, a number expected to increase as assessment of damage in the area is finalized. 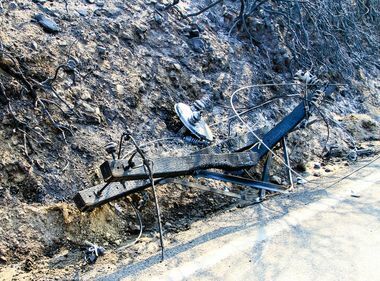 Most of the damaged equipment is in Little Tujunga Canyon and on the north side of Santa Clarita. Currently, there are 80 customers without power. SCE crews have a difficult task ahead of them. In addition to ash in the air, the crews will have to deal with difficult terrain and steep slopes. Cranes and backhoes will be needed to remove the old poles and place the new ones into the ground. In areas that cannot be reached by vehicles, SCE helicopters will be utilized. The restoration work will take at least several days to complete. On this first day, crews will focus on cleaning up the damage, including removal of damaged poles, wires and insulators. They will also prep for new poles and stringing wire. 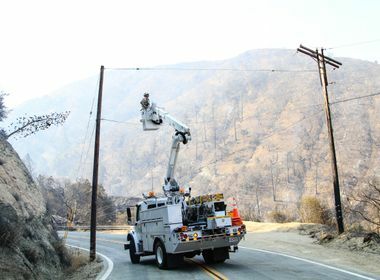 Working with the first responders, SCE hopes to get its helicopters in the area on Thursday to further assess the damage to electrical equipment. “This is a challenging restoration effort as most wildfire restorations are,” said Whitman.